On Friday, Nov. 16, the ETSU Jazz Ensemble hosted their “Dance Music” concert, which brought music of the past to the people of the present. Old and young alike rat-tatted along with the conductor, musicians, dancers and vocalist to the music of Big Bands from the 30s, 40s and 50s. Before the performance, concert-goer Becky Pinkston reminisced about her childhood and the impact that Big Band music had on her adolescence. Complete with classics like Duke Ellington and Jelly Roll Morton, the performance hit a high note for the Big Band lovers of the audience. 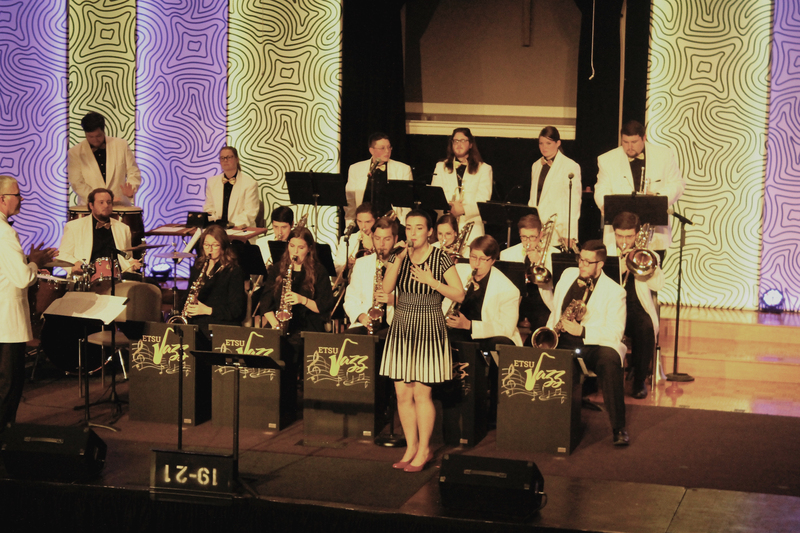 By the end, the ETSU Jazz Ensemble successfully jived its way into Pinkston’s past by reminding her of times with her dad, such as sitting and listening to old records. While the performance rang successful for those familiar with the Big Bands, the concert also plucked the ears of the younger audience. Songs like “Route 66” and “Hey Pachuco!,” which was featured in Jim Carey’s “The Mask,” had everyone snapping along. As if the music wasn’t enough, “Dance Music” featured two dancers and a vocalist as well. Throughout the performance, dancers Emily Matney and Casey Finkle interjected into the experience to exemplify the dance-appeal of Big Band music. For “Route 66,” Hannah Lawson belted the notes in a way that could convince anyone to take that California trip. After incorporating both dance and lyrics into the performance, audience members of “Dance Music” could barely sit still. Before leaving, sophomore Heidi Wheley expressed her excitement. Ultimately, the ETSU Jazz Ensemble’s production of “Dance Music” tickled the fancy of everyone in the audience. Through the incorporation of musicians, dancers and vocalist, “Dance Music” harmoniously expressed the energy and spirit of the Big Bands and made boredom virtually impossible. The only thing missing from the experience was Duke Ellington and Glenn Miller themselves. Previous post "Baskerville: A Sherlock Holmes Mystery"